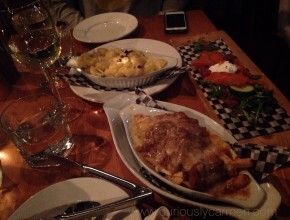 So after an expensive lesson learned not to order the main dishes at The Flying Pig, I was back with Shell for famous happy hour but at their Gastown location in February (sorry for late post =p) . If their service at the Olympic Village location wasn’t spectacular, I probably would have been less inclined to try this chain again! Originally, we were told that there was a 30 minute wait, but luckily someone just left and we were seated in less than 10 minutes! We saw some empty tables, but were told that happy hour was only served at the bar area. Seating was a bit cramped, as I found with the Olympic Village location as well. 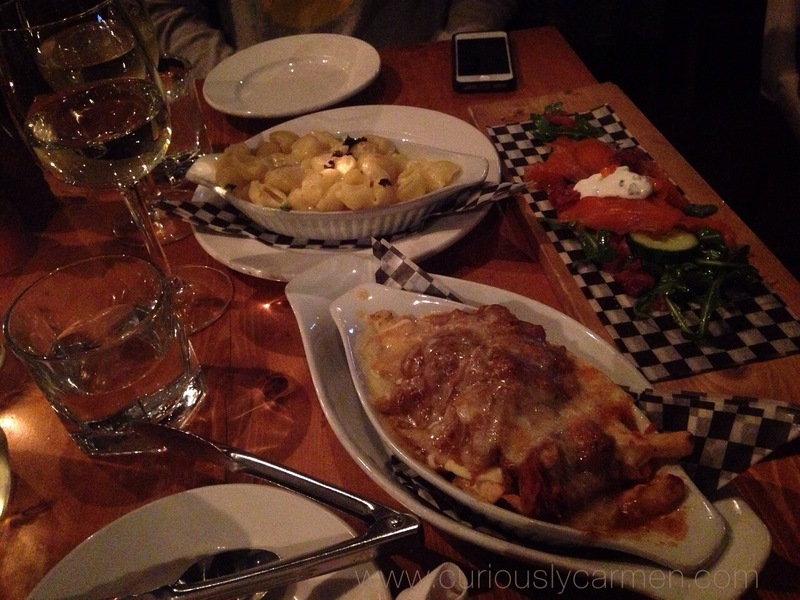 Shell and I decided to share some cheap happy hour appetizers. 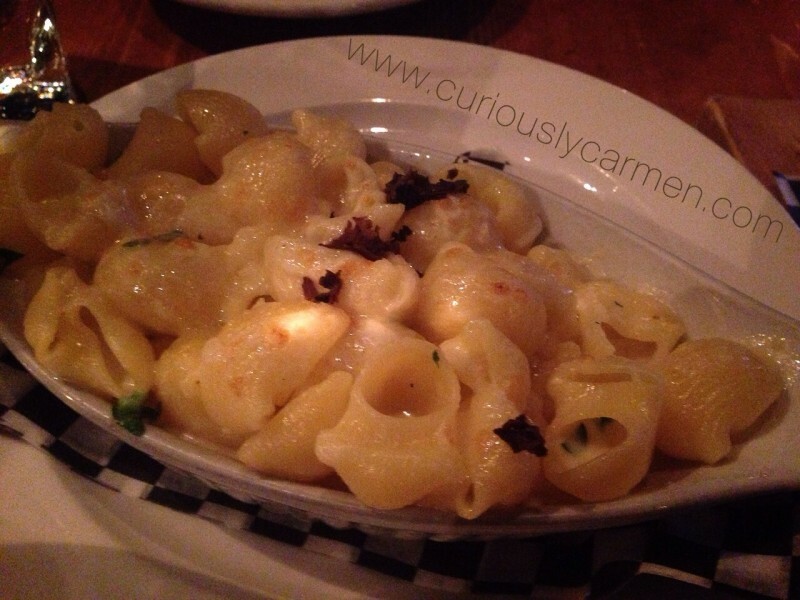 The first thing that arrived was the truffle mac and cheese. It looked very plain, with barely any traces of veggies or meat but hey, you’re only paying $5 so don’t expect much. With that said, I was so shocked at how amazingly delicious this mac and cheese was. I don’t know what they put it in but it was amazing!!!! Smooth, creamy, cheesy, with just the right amount of herbs and bursting with flavour… I knew I had made a good decision giving The Flying Pig a second chance. 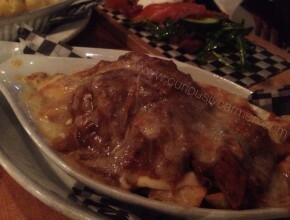 This pulled pork poutine does not look appetizing from the picture, but it was. 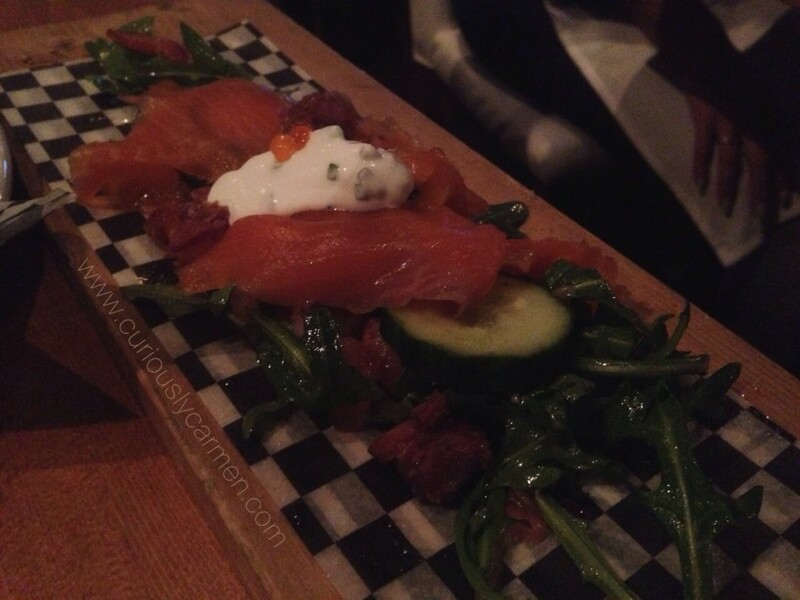 I ordered this with the boyfriend at the Olympic Village location, which was one of the highlights of our meal. At this location, it was no different. There was a generous amount of pulled pork, which was tender and flavourful. The poutine came slathered with a generous amount of gravy and cheese itself, yummmm. The fries itself were standard, but this dish was delicious nonetheless. After finishing those delicious dishes, we decided to order one more appy which was the short rib croquette. We had been eyeing this from the customer sitting next to us, and he told us it was really good. Oh man, was the short rib croquette delicious. The batter was super fresh and crunchy on the outside, but the short rib inside was soft and delicious. It reminded me of a takoyaki.. except deep fried. The short rib was mixed in along with what I’m guessing mashed sweet potato and herb filler? It was very soft and had a creamy mashed potato texture inside. Oh right, Shell and I each ordered a glass of wine too! It was $4 a glass which is pretty cheap, but it is any type of red or white wine. This happy hour trip to The Flying Pig restored my faith in them! 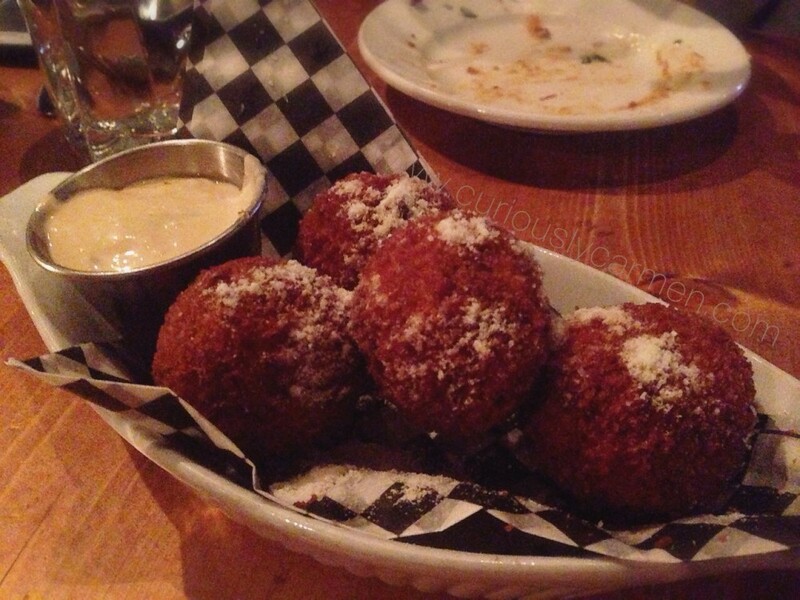 They have delicious appetizers but you’ve been warned about their not-so-stellar main courses. Have you been here for happy hour? How did you like it?